Rudy Funk, who has left AFC Mansfield after four successful years and two promotions with the club. Rudy Funk’s successful reign at AFC Mansfield has come to an end, with the charismatic manager insisting he was sacked, and did not resign. However, Funk says there are “no hard feelings” and stresses he has “nothing but respect and admiration” for the Bulls. “The club have put it out that we have parted ways by mutual consent,” said the Romanian-born 61-year-old. “But in my book, it is a sacking. “I still don’t know the exact reason for my departure. I have always expressed my concerns about the development and the professionalism of the club, and my thinking probably differed a bit from that of other people. “But I wish the club all the best. I was extremely proud to wear the AFC Mansfield badge. I cannot criticise anyone or say anything negative. 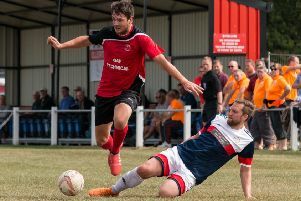 The decision to part company with Funk was made with AFC next to bottom in the East Division of the Evo-Stik Northern Premier League and facing a relegation battle. But since joining the club in 2014, he has overseen two promotions as well as terrific runs in the FA Cup, reaching the Third Qualifying Round twice. In a statement, AFC said it was “with the greatest reluctance” that the decision had been made, and thanked Funk for the club’s “incredible rise”. The statement continued: “The club puts on record our gratefulness for Rudy’s efforts, and wish him all the best in his future endeavours”. This week, Bulls chairman Andy Saunders reiterated that Funk’s departure was agreed by the two parties. AFC were expected to name a new manager last night (Tuesday). As for the experienced Funk, his record at the club will read well on his CV, and he expects to be back in football soon. He added: “AFC are a small club without extraordinary financial backing, but we had the most amazing four years and achieved a lot of things. “The staff and players were immense, and I have nothing but praise for everyone behind the scenes there, and also the local community.